Here it is at last...the conclusion to my interview with Derrek Lennox, Publisher of Crystal Fractal Comics! DC: Let's get specific now with the series Dr. 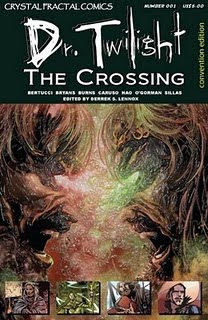 Twilight: The Crossing...Why should a new reader pick this series up? What role does this series play in the overall grand scheme of the CFU? DL: This title looks at the history of the universe leading up to the Crossing. This is not an anthology as all of the stories are related. Each story involves at least one of the magically powered people that Natanael de Velazquez (aka Doctor Twilight) recruited to come to the Crossing in Baguio. Many of these people did not make it, and these stories present the interconnectedness of several plot threads – and expose why they did not arrive. Importantly, it also establishes several of the so called antagonists to the main storyline – some overt, and some covert. DC: Dr. Twilight is one of the central players in the Crystal Fractal Universe, but would you describe him as a hero? DL: Not in the "Superman" sense... Doctor Twilight is a person with a mission motivated by a mixture of the need for self-redemption and the need to learn. DC: Dr. Twilight is immortal, and that presents a really unique opportunity to visit with him at various historical eras and at various points in his evolution as a person. So here's a two part question...what's your personal favourite time period in the past and do you have plans for a Dr. T story during that time? DC: How would you describe Dr. Twilight's character arc over the several hundred years that pass since we first encounter him? Has he changed? For the better or perhaps for the worse? DC: As the editor of the series, what type of stories are you looking for in this series? DL: Each story must fit into the puzzle of the history leading to the Crossing. DC: What appeals to you about anthology projects? DL: As noted, we can’t really consider the Crossing an anthology. But what I do like about this style of project is the ability to work with multiple writers and artists to get their lens into the Crystal Fractal Universe while at the same time, being one of a handful of people that knows how each of these stories actually related to each other. DL: Don’t let me stop you from pumping your favourite stuff. For me, I would have to say that the team of John Byrne and Chris Claremont for their run on the Uncanny X-Men was by far my largest influence. I continued to read the X-Men long after they both departed just because of their tenure on the book. I also give Wolfman and Perez a “tip of the hat.” Peter David, Neal Adams, Paul Michael Smith, Kurt Busiek, George Perez, Arthur Adams, John Bolton and Bill Sienkiewicz were – and are – continuing influences. Peter David is a writer who can work well with many artists – and the quality of his story telling remains consistent. Claremont, in my opinion, needs to have a certain type of artist to work with which is why I find his stuff a little more inconsistent. So, I find his work with John Bolton, Paul Smith, and Bill Sienkiewicz far more of an influence that his work with other creators. James Robinson’s work with Paul Smith (from the Golden Years to Leave it to Chance) another exceptional pairing. It shows how a good collaboration can create something exceptional. DC: Your duties as publisher and editor (along with the day to day stuff that we all deal with) take up a lot of your time. Do you still find time to write and draw? DC: As a publisher and editor, you must receive lots of submissions from artists and writers. Can you tell us some "do's" and "don'ts" when it comes to seeking work in the comic book industry? DL: We receive quite a few each and every month at a fairly steady pace. The one thing that I would tell people who are making submissions is this: read the submission guidelines as each company is different, and then follow them. I would say that at least half of what we receive doesn't conform with our submission guidelines - and we can't do anything with them when that happens. DC: Can you tease the audience with any upcoming storylines or projects that you're excited about? DC: Derrek, thanks a lot for your time. Even though I’ve written several stories for Crystal Fractal Comics, I also happen to be a fan. It was great to get your take on the inner workings of the CFU, and I’m sure I’m not alone when I say that I’m eagerly awaiting the next projects that you’ll be putting out there!